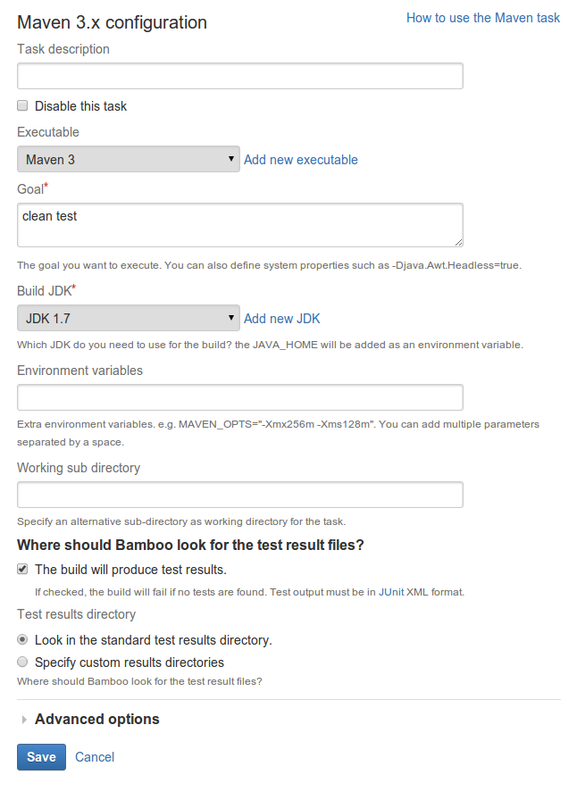 This page describes how to configure a Bamboo task to use a Maven executable. Apache Maven is a tool used for building and managing Java-based projects. Forgetful Maven Users, Rejoice! A new Bamboo task “releases” you from worry. Click the name of an existing Maven task, or click Add Task and then a Maven option (e.g. Maven 2.x) to create a new task. The Maven executable that is available to perform the task. The executable that you select will become one of the task's (and so, the job's) requirements. The Maven goal that Bamboo will execute. You can use '-D' to define one or more JVM parameters. For example, -Djava.awt.headless=true will pass the parameter 'java.awt.headless' with a value of 'true'. Multiple maven goals can be specified, separated spaces. You can include variables (see Using Global or Build-specific Variables). Select to have Bamboo skip log parsing. The JDKs that are available to perform the task. The JDK that you select will become one of the task's (and so, the job's) requirements. You can add other JDKs, if required. The path to your Maven project file, relative to the working sub directory specified. If this is not specified, Maven will use the pom.xml in the root of the working sub directory. Additional system environment variables that you want to pass to your build. Note that existing environment variables are automatically available to the executable. You can also include Bamboo global or build-specific variables (see Using Global or Build-specific Variables). Multiple variables should be separated with spaces. Parameters with spaces must be quoted (e.g MAVEN_OPTS="-Xms200m -Xmx700m"). Choose one of the following: Look in the standard test results directory or Specify custom results directories – Specify the alternative directory, relative to the root directory, where test results will be created. You can use Ant-style patterns such as **/test-reports/*.xml . Bamboo requires test results to be in JUnit XML format. For jobs that use CVS, the root directory is <bamboo-home>/xml-data/build-dir/JOB_KEY/<cvs-module>.